What are Minami Shunichi’s true feelings? Minami Shunichi has pledged to take responsibility and protect Horikiri Chiyomi if she is ever discovered by anyone. What does he actually think of her, though? On their way from school, Horikiri Chiyomi sits atop Minami Shunichi‘s shoulders wondering exactly that. (He brought her out to enjoy the fresh air after seeing no one was around the area.) Really wanting to know his thoughts about her, Horikiri Chiyomi moves to ask him about his feelings, but when he turns to answer her and his lips come extremely close to her, she changes her mind, shying away. Minami Shunichi and Horikiri Chiyomi arrive home to find Minami Tomiko clutching her chest in pain. She is immediately rushed to the hospital where he loses Horikiri Chiyomi. After Minami Shunichi is given the news from his mum that his grandma is okay (only that she requires a thorough examination), Minami Shunichi makes a stop at the restroom. As he can’t have Horikiri Chiyomi follow him in, he tells her that he’ll only be a moment and asks for her to wait for him. He removes his jacket and carefully lays it down with her inside on the seat situated outside. When he comes back, he immediately notices that the jacket has been moved. Going to check the jacket, Horikiri Chiyomi isn’t there. He checks under the seat and doesn’t find her. She’s nowhere nearby. After noticing the curious sight of Minami Shunichi talking to the jacket, a young girl—a patient at the hospital—called Miyu approaches the jacket and begins poking and shaking the jacket out. Her actions has Horikiri Chiyomi fall out of the jacket pocket and landing harshly on the seat below. She is taken away to her ward and tied to a piece fo red yarn thinking she’s caught a fairy. Horikiri Chiyomi tries her best to break free, but she’s not strong enough. Horikiri Chiyomi is let off the red yarn. Unable to escape, she stays by Miyu‘s hospital bed to watch her draw a picture of her mum. Horikiri Chiyomi tells her that her mum looks like a sweet mum which has Miyu reveal that her mum doesn’t like her. Her mum comes into the room shortly after to coming off as Miyu describes. Miyu‘s excitement over seeing her mother visit is completely ignored as her mum goes straight to asking about the surgery and how she told Dr. Koide she didn’t want it. Miyu sits silent, submissively listening to her mum ask whether she knew about the many people who are worried about her before expressing a sigh and telling her not to cause her anymore trouble. Her mum seems to find her a bother. When she notices Miyu‘s downcast expression, her mum softens her tone slightly, but she doesn’t become any more sympathetic. She tells Miyu that continuing to sulk won’t make her better. She then leaves as she tells Miyu she’s still work to do. These thoughts is brought about by what Minami Tomiko says about the One Inch Princess. (Minami Tomiko shares the same ward and has been listening to Miyu talk as well as seen the whole exchange between Miyu and her mother earlier in the day.) Minami Tomiko had mentioned beforehand that the One Inch Princess only appears before those in need and anyone who tries to tie her up or bully her will make her disappear. When Minami Tomiko hears Miyu think herself in such a way, she bolts up from her hospital bed and tell her that there is no mum in the world who doesn’t love her child. What’s more, the One Inch Princess wouldn’t visit her if she wasn’t considerate of her mum. This last comment seem to ease Miyu and she prepares herself to sleep. Everyone but Horikiri Chiyomi eventually falls asleep. As she lay in bed awake, Miyu‘s mum comes into the ward during the night. Hidden under the covers, Horikiri Chiyomi hears her mum say words to her she seems unable to say to her daughter when she was awake: "Miyu, I’m sorry for making you suffer." She is like all mums. She does love her daughter only she’s unable to express it directly it seems. Not aware that the ward which his grandma and Miyu are is where Horikiri Chiyomi is, Minami Shunichi searches well into the night for her—he searches the corridors, room, under chairs, calling for her. He had been in Miyu‘s ward earlier in the day when he visited his grandma and was introduced to Miyu and her mother, but he failed to notice Horikiri Chiyomi trying hard to catch his attention with her waving. The separation has Minami Shunichi fraught with worried. Having fallen asleep sitting on a seat outside (presumably) his grandma’s ward, he dreams of Horikiri Chiyomi leaving him. In this dream, Horikiri Chiyomi is to her normal size. She a princess who can’t stay in the same world as his. She thanks him for taking care of her before saying her goodbyes as she must return to the moon. As she floats up towards the moon, Minami Shunichi—a commoner—calls after her over and over in vain. A slip of the arm which props Minami Shunichi up awakens him from the dream. His gaze wanders the corridors. "Chiyomi," he calls for her. After the short nap, he continues to search for her with no luck. Tired, he flops down on a seat. There, his grandma calls for him (she actually calls for Noboru). She’s come to let him know Horikiri Chiyomi (rather the One Inch Princess) is in her ward, under Miyu‘s bed sheets. Minami Shunichi‘s found her. Relief washes over him they head home, back to Minami Shunichi‘s room to sleep. The sighting of a small figure outside Minami Shunichi‘s window has Horikiri Asuka meet Takagi Riku at her place to see if he knows where her sister is, but he tells her that (despite being one of her closest friends) even he doesn’t know. Taking the conversation to the quiet seaside and seating themselves on an old fishing boat, she goes on to tell him about seeing a tiny person and how she saw such a person at her neighbour’s house. Takagi Riku‘s attention is immediately drawn. He turns to her and ask whether she saw such a person at Minami Shunichi‘s place. Horikiri Asuka affirms with energy. Takagi Riku turns away to think over the information making Horikiri Asuka think that he didn’t believe her and goes about dismissing it as an illusion. Takagi Riku stops her, "No, it is possible", but then he starts talking about a figurine, an elaborate figurine. Takagi Riku didn’t reject the possibility of her sighting of a Chobiko as absurd, but then he can’t seem to accept it as real either. Horikiri Asuka isn’t able to confirm what she probably knows is the story behind her sister, until the final clue to unveil the whole true presents itself during a trip to the hospital with Minami Shunichi and his mother to visit Minami Tomiko. It comes in the form of a handkerchief which Minami Shunichi hands her after being splashed by a man washing his car on the side of the street. This handkerchief is the same handkerchief used as a background for Horikiri Chiyomi‘s first video message to her parents. 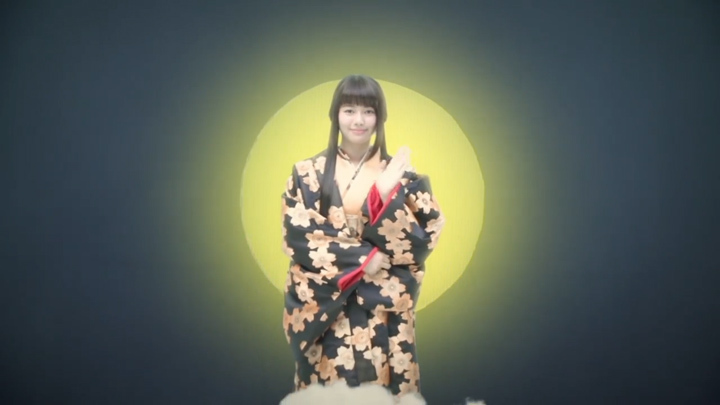 Horikiri Asuka doesn’t connect the handkerchief to the video message at first. She only notices how cute the handkerchief is, but upon taking a closer look (she does this after going home quickly to change into another set of clothes), it hits her. She goes off and rewatch the video message from her sister and discovers the matching pattern. She’s found her sister out. 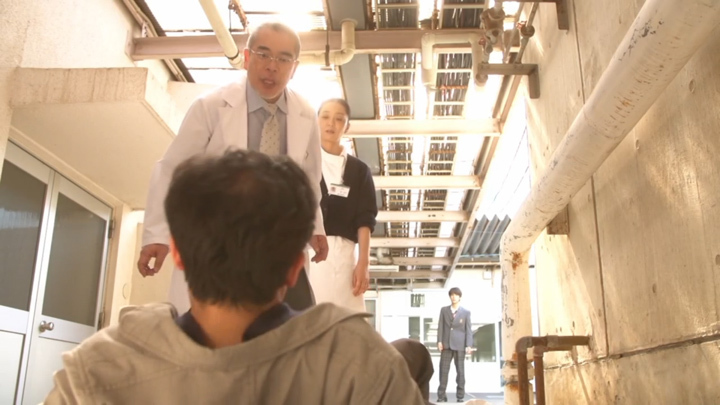 The next scene, we are taken to the rooftop of (we’re guessing) the hospital where Minami Shunichi and Horikiri Chiyomi talk about how Miyu‘s been thinking about the way her mum regards her and wanting to do something about it. They’re completely unaware that as they’re discussing this, Horikiri Asuka is present. She slowly builds up to revealing her newfound knowledge, asking Minami Shunichi who he was talking to before asking what he was hiding when he goes to try cover Horikiri Chiyomi from her sister’s view. When he struggles to answer, Horikiri Asuka moves to reveal her knowledge: she asks him whether what he was hiding is her older sister. His shock indicates to her a yes. Horikiri Asuka moves to have him see her sister. Minami Shunichi looks over at Horikiri Chiyomi, seeking her thoughts about revealing herself to her sister. She nods. Horikiri Chiyomi and Horikiri Asuka meet face to face. There’s no shock on Horikiri Asuka upon seeing her sister in such a state. Horikiri Chiyomi apologises to her sister for not telling her it which has Horikiri Asuka apologise for not noticing. Horikiri Asuka then smiles and asks whether there was anything she can do for her. Horikiri Asuka‘s offer to help Horikiri Asuka has her join Horikiri Chiyomi and Minami Shunichi with getting Miyu to see that her mum does love her very much. Miyu‘s mum gets to Miyu‘s side distressed by how her daughter didn’t want to trouble her when she’s in pain. She tells her she should call her. Horikiri Asuka takes the opportunity to bring out the drawings Miyu‘s been afraid of showing her mum. Her mother tears up at seeing them as she realises how much her daughter loved her and how much she must have suffered because of her mum’s inability to express her true feelings. She apologises to Miyu for not understanding her daughter’s feelings as well as not expressing her own feelings to her. She follows with telling her daughter that she does love her very much and pleads for her to get well and stay by her side. Hearing this, Miyu tells the doctor (who’s come in to check on her) that she will agree to have the surgery. Ever since Minami Tomiko was admitted to a ward, Minami Noboru has been lurking around his mother’s ward. No one has noticed his presence except his former partner, Minami Emiko. His presence has her bring along the divorce papers which Minami Noboru has been after for so long. She hands them over to him during a meeting outside the hospital building which has her learn that Minami Noboru and his current partner, Kanae, was due to have a baby. It’s here that Minami Shunichi and his father settle things as well. Initially, when Minami Shunichi sees his father, he appears to want to storm over to him and give him a scolding, but he is stopped by Nomura Sayori‘s father who gets there first to land a punch on his father face before saying everything that probably Minami Shunichi wanted to say to him. Nomura Sayori‘s father rhetorically asks Minami Noboru whether he knew how hard it’s been for Minami Emiko, how she’s suffered because of him. He tells him that since he left, she’s had to work morning till night all by herself to support her family and raise Minami Shunichi. The encounter has Minami Noboru apologise to both Minami Emiko and Minami Shunichi (who he notices after Nomura Sayori‘s father ends his scolding). He ten moves to tell them that he will be taking his mother and caring for her. This has Minami Shunichi forbid him doing such a thing, saying that he’s decided to protect both his mum and grandmother. Minami Emiko agrees with her son, saying that Minami Shunichi‘s grandmother is an important part of the family. Minami Noboru lets it be and tells his son what Minami Shunichi already knows: he’s leaving his mum and grandmother in his son’s care. Before he leaves, he gives him one last advice. He tells Minami Shunichi he shouldn’t quit right after he lost and to continue with kendo. Minami Shunichi sends his father off rather acceptingly, "You should protect your partner this time." Presumably, this is the last time he and his father will see each other. Just after Miyu and her mother express their feelings, before he runs into his dad at hospital with his mum, Nomura Sayori calls him out of the ward to ask him to properly reject her, which results in a confession of his feelings for Horikiri Chiyomi. Standing out in the corridors, she tells him that she needs to make plans for her future romances. To do that, she needs to have him reject her properly. By that, she means for him to tell her straight out whether he likes Horikiri Chiyomi. It takes Minami Shunichi a moment, but eventually, he comes out with the truth. He tells her that he does love her. He’s realised that all along, for a long time, he’s loved her. He then apologises for rejecting her. Nomura Sayori jokes about how humiliating it is to be rejected in such a way as her way of accepting the rejection. She thanks him for the answer and requests he at least see her off until she’s out of his sight, which Minami Shunichi agrees. He then makes his way back to the ward where Minami Tomiko, Horikiri Asuka and Miyu are huddled over a manga and crying over the manga they’re reading; meanwhile Horikiri Chiyomi is on a table off on the side wailing over the possibility that Minami Shunichi and Nomura Sayori‘s gotten together. He enters the ward and announces to his grandma that he’ll be heading off. He then turns to Horikiri Chiyomi and calls to her: "Princess, we’re going now." He extends his hand for her. Horikiri Chiyomi nods happily and jumps on, and she is placed in his pocket. He allows Miyu to thank Horikiri Chiyomi for the magic she worked on her and her mother before Minami Shunichi takes his leave. Outside in the corridors, after realising the feelings for Horikiri Chiyomi, he seems to want to express them aloud to her, but he does so without her knowing about them. He takes a couple of strides down the corridor before he slows to a stop. He looks at his pocket and then gently presses his pocket to have Horikiri Chiyomi up against his heart for her to hear his heartbeat. The action surprises her. It has her ask him what was happening. Her question is ignored as he goes straight onto telling her to never leave him, as where she is now (close to his heart or in his heart) is where she belongs. With Horikiri Chiyomi unable to hear him through his loud heartbeat as well as Minami Shunichi not wanting to repeat what he said to her, Horikiri Chiyomi remains none the wiser of his true feelings for her. What a great episode to follow the last one. Episode 7. Minami Shunichi promises to take responsibility and protect Horikiri Chiyomi. Episode 8, he realises his feelings and tells her never to leave him! The revelation of his true feelings for Horikiri Chiyomi was not too exciting, but we loved how he had her against his heart as he confessed to her. It’s quite a cool scene because it showed how his heart now beats loudly for her, but it also served to stop Horikiri Chiyomi from hearing his words because seemingly he’s not fully ready for her to hear. 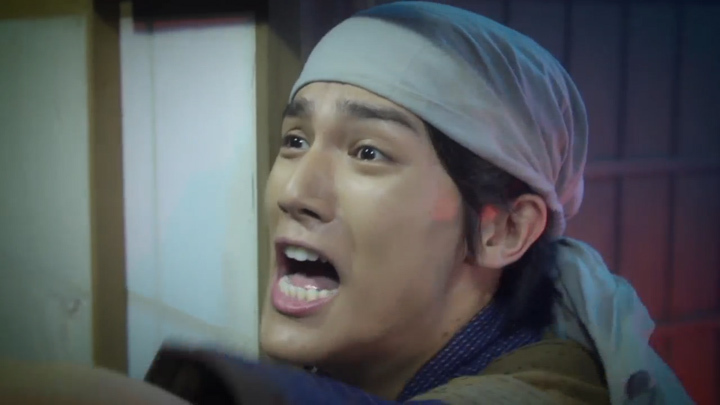 It allows us viewers to know how he feels; only Horikiri Chiyomi doesn’t know. It’s going to be good. For so long, Horikiri Chiyomi‘s been forced to watch Nomura Sayori make moves on Minami Shunichi and making her feel like she could never be loved by him. How awful it must have been to have to listen to his heart beat in reaction to Nomura Sayori in the early episodes, too, making her think that he liked Nomura Sayori. Now, it’s not beating for Nomura Sayori, but for her. We can’t wait to see Minami Shunichi reveal his feelings for her! The mission behind Horikiri Chiyomi turning small, it seems is to help people open up, express their true feelings and then come back together. Last episode she helped open communication between her mum and dad which had them state their love for each other. This episode she helped Miyu and her mother open up and admit their true feelings as well. We’re guess helping Minami Shunichi and herself express their true feelings and come back together is the next and final thing she’ll do before turning back to her normal size. We’re hoping Minami Shunichi‘s confession will come when Horikiri Chiyomi returns to normal size and the series will receive a similar ending to the One Inch Princess‘ who was said to have become big and got married. We’re wondering if there is a twist in there somewhere like the One Inch Princess being related to the Minami family. Is there some kind of connection to Minami Tomiko. She just seems to know so much about the One Inch Princess. We wonder if there’s some sort of connection with why she calls Minami Shunichi Noboru as well or if it’s just her starting to lose a bit of her mind. Super excited to see what comes after this episode. We’re hoping for Takagi Riku to come into the picture for a final show down between the leads, but there isn’t a lot of episodes left and there’s still Horikiri Chiyomi being small to deal with, so we’re expecting a quick exit from Takagi Riku as the drama is down to it’s last two episode. But still, we’re hoping it’s not a quick exit. We’re hoping, hoping, hoping Takagi Riku gets a bit of screen time—maybe 3/4 of an episode sometime in the next two episodes? That would be nice. :oD :oD.